How does the Clubcard / Hotels.com deal work? What is happening with Tesco and Hotels.com Clubcard redemptions? The saga over the new Hotels.com Clubcard redemption option continues to rumble on. As I wrote on Monday, Tesco launched this offer last week by stating that all pre-paid hotels on Hotels.com could be booked using Clubcard vouchers. As you could swap your Clubcard vouchers for a Hotels.com voucher worth 3 x face value, this was a decent deal. Within 48 hours, highly critical comments were appearing on the Clubcard / Hotels.com page saying that the deal came with huge exclusions. Not only could you not pay taxes and fees with vouchers, but pretty much EVERY branded hotel on the planet was excluded. This is the list of hotel chain exclusions which Clubcard was circulating – it is vast. 2) Copy and paste the voucher code above. The voucher amount will be deducted from the cost of the first room booking (excluding taxes & fees), enter your details and pay the balance. 3) You will receive a confirmation email from Hotels.com including the booking details. You can’t use this voucher on taxes, fees, or charges including extra guests, phone calls, cancellation fees, parking, or other charges. You must pay these charges when you make your booking, or directly at the hotel. Please check availability before you exchange as once you’ve received the voucher, we can’t refund it.You can use this voucher only once and in full. You won’t be able to use it again, even if you cancel your booking. Vouchers cannot be added at a later date. Vouchers cannot be used for bookings paid for in a foreign currency. The usual Hotels.com terms and conditions apply and all bookings are subject to availability. No mention of any exclusions there either. Sounds good. But what happens in reality? Having a clear couple of days in late July, I decided to book myself into the ibis Rotherham East for some much needed R&R. The website said that it is only 35 minutes walk from Maltby Leisure Centre and 4.5 miles from Rotherham General Hospital, so it sounded good. I also happen to know there is a Wacky Warehouse across the road. The ‘pay in advance’ price was £41.41, split into £34.51 of room and £6.90 of tax. ibis is listed on the ‘excluded chains’ list circulated by Hotels.com. Let’s click on that ‘Terms & Conditions’ link in the image above. On that list – which is the same list I circulated on Monday – it says you can’t use them at ibis or a few hundred other chains. So ….. what is going on? Tesco is adamant that there are no restrictions, whilst the combined experiences of myself and those people who have posted on the Clubcard website suggest otherwise. Let’s see if this is some sort of temporary IT issue or not. Is the Marriott Moments auction site getting more useful? What a mess. The lack of common sense by some people (companies) never fails to amaze me. @Rob are you asking for a refund of the voucher and challenging Tesco on their lack of up front notice on T&Cs? I’m impressed with the Uber deal, however. As you said, a genuine 3x. I converted another £50 yesterday. UK use only but can be used for work trips by taking a screen shot of the ‘Your Trips’ screen. Makes avios at 1.25p look expensive. Have you checked how the invoice appears too with them when using the credit? I normally submitted those. Told a few folk at work today about the Uber deal, they were pretty impressed 😉 I’ve transferred a few vouchers that were due to expire. Would be even nicer if it had worked abroad too. The emails received post journey show a zero balance. But the individual journeys in the app have a price (ie amount taken from the credit). I screen printed one only today and put it in my expense claim. What about the PDFs you get from the Uber website though? (when you click through from the email) IME those have always correctly shown the actual charge, regardless of payment method. @Alan. The pdfs show the full fare amount. Nice article, Rob but an utterly ridiculous situation of Tesco/hotels.com’s making. Maybe, in a few days, the link will be updated to show the Ibis is bookable with clubcard vouchers: but at a higher price! Rob – it was suggested you needed to click through a specific hotel.com link you received from Clubcard for the voucher to work – did you do this? No, but you don’t need to do this – I pasted all the wording into the article. 1) Click the link here” that you mention above isn’t an actual link then? Your voucher will work on 100% of pre-paid hotels on hotels.com. Any reference to a hotel exclusion list within T&C’s on hotels.com does not apply to you. Should send them my screenshot …..
Having lived in London for 10 years- a stay “anywhere” was a break, 🙂 . Birthplace of the Chuckle Brothers and Rob Burgess? Have emailed Rob to get an approximate date for his visit and will bimble around with my autograph book in search of the three of them! 🙂 . Paul Shane, runner Peter Elliott, that guy who was world darts champion a few years ago, William Hague and indeed Justine Greening who lived on my road and was a year ahead of me at school. The only consolation must be you don’t ever have go a) to maltby and b) Rotherham ibis with spectacular views of the sir jack, McDonald’s, morissons oh and the M18! What a shambles from Tesco & Hotels.com! How difficult can it be to create a business model and then just implement it? If they want customer feedback, why not ask for it prior to launching the service. There is more to Rotherham than you think! And I saw it all over 18 years …. When I was a lot fitter I did the Round Rotherham 50 mile run twice – it was surprisingly scenic and quite a bit of fun! 100 mile run? Monumental effort! Rob, I think the problem may be with Hotels.com, not Tesco. I won a Hotels.com voucher through the Guardian newspaper some time ago and when I went to redeem it I was restricted to hotels I would not choose to stay in. I had to write a couple of stern emails pointing out that the exclusion of the hotels was not pointed out to me in the T&Cs of the competition. I was told that all Hotels.com vouchers had this restriction. I persisted and was issued with a new voucher code (so they do exist) and enjoyed a pre-flight hotel at the Radisson, Heathrow. As Tesco have now confirmed there are no exclusions, they must insist that Hotels.com issue the correct redemption code. Thank you for posting your review. This was something we originally we missed off the terms and conditions but thanks to your feedback we have now added this on our website. 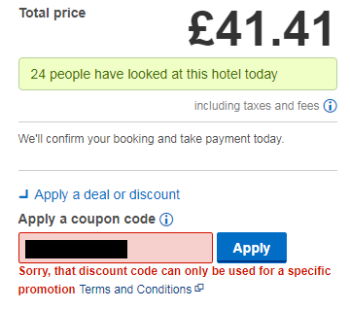 I can confirm the link of exclusions on the hotels.com website doesn’t apply to the Tesco Offers and there are actually no exclusions. I would recommend to screenshot that statement, use it in any correspondence if issues arise with redemptions. That sounds positive doesn’t it? Presumably there are some teething problems with the voucher but looks like it will actually have real value by the time they fix the IT. Now I don’t really bother actively collecting avios any more, this gives me a reason to get the clubcard out again. Competely off topic:if I’ve paid for legroom seats on long haul Y on a cash fare and I use avios to upgrade, so I get a refund of the seat booking costs? And is the upgrade to PE worth it on the 787? Thanks! Imho the upgrade is especially worth it on the 787 which is dire in economy with very narrow seats. I don’t think you will get a refund for your seat reservation but you should be able to reserve a seat in pe for whatever that normally costs minus what you have already paid. I find that this is generally the case with hotels.com promotions – I seem to get an email most days talking about 50% offers, but the list of excluded hotels probably covers pretty much every hotel on the planet, except perhaps a 1 star in rural Azerbaijan. Having said that, I do like the free night with every 10 booked that hotels.com offers and regularly make use of this. Er…. isn’t Rob from somewhere near Rotherham, originally? Well, from up North anyway, and it’s all “up North” to me! :-)/ R&R with family nearby might be nice. off topic but thanks to rob for the article RE world cup flights last week. I have used my (early activated 241 voucher ) and boked CW RFS tickets to Moscow for me and 3 mates for the first week of the championship. Amazing value really when all direct flights have already been block booked. outbound on the nice a321 ex BMI ,back on a 777. Just a question. Didn’t there used to be a rule that you could only book redemptions for people in household account or on F&F list? If you’re in a HHA yes. If you’re not you can book for anyone which is why I am not in a HHA. So actually no reason for a F&F list if you are not in household account ? It saves you inputting their details each time you book … that’s about it.